Kansas City International Airport – which operates mainly domestic, but also some international routes – is one of the largest airports in Missouri. 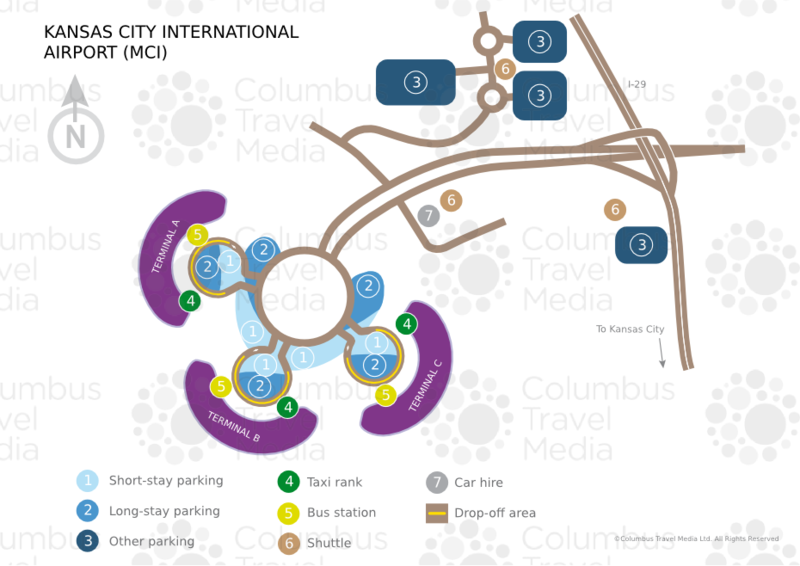 Our Kansas City International Airport guide includes information on terminal services, public transportation routes and nearby accommodation options. Terminal A has closed for refurbishment and expansion. When it re-opens (scheduled 2016), Terminal B will be demolished and Terminal C will be rented out as office space, making the airport a single terminal facility. Information kiosks are located at the bus shelters in the economy car park. Courtesy telephones throughout Kansas City International Airport provide an information service (tel: +1 816 243 5237). Ambassadors are also on hand to provide assistance to passengers. From central Kansas City, take Interstate 29 heading northeast and turn off at exit 13 onto Cookingham Drive. This road leads directly to the airport (journey time: 25 minutes). From the north and west, take Interstate 435, turn onto Interstate 29 and likewise take Cookingham Drive to the airport. Red shuttle buses provide free transportation between terminals and to/from the 'circle' car parks. Blue buses offer complimentary transfers from the economy car parks to the terminals. Bus:The Metro Bus (tel: +1 816 221 0660; www.kcata.org) provides services from Monday to Friday to central Kansas City from the stands located outside the terminals (journey time: 45 minutes; fare: US$1.50). Shuttle:SuperShuttle buses (tel: +1 800 258 3826; www.supershuttle.com) serve Kansas City and local areas; desks are located in all terminals. A number of other shuttle service providers are also available (a full list is available on the airport's website). The general shared-ride fare to central Kansas City is around US$20. Taxi:Taxis are available via courtesy telephones located both inside and outside the terminal building at each baggage reclaim area. Taxis can also be booked from external, personal phones (tel: +1 816 243 2345). The fare to central Kansas City is approximately US$45, depending on specific destination and traffic conditions. ATMS are available throughout the airport both pre- and post-security. There is a selection of restaurants, bars, coffee shops and fast-food facilities in all terminals. The best choice is to be found in Terminal B, with a tequileria, wine bar, grill restaurant and a purveyor of pizza among the options. Various shops are available in Terminal B, including newsagents, gift shops and specialist retailers such as a golf shop and children's clothing outlet. Terminal C houses a single news and gift retailer. A lost and found service is available at the airport with a designated office for items lost in the terminal (tel: +1 816 243 5237) and items lost in the parking areas or on the red or blue airport buses (tel: +1 816 243 5870). Luggage lockers are not available at the airport. Other facilities at Kansas City International Airport include a first aid centre. There are self-service business facilities at the business centres in all terminals. Additionally, the on-site Kansas City Airport Marriott hotel (tel: +1 816 464 2200; www.marriott.com) has a fully equipped business centre, as well as a number of meeting rooms, including a ballroom accommodating up to 650 delegates. Free Wi-Fi internet access is available throughout Kansas City International Airport. In addition, there is an on-site post office located at 156 Paris Street. The terminal buildings are fully accessible, with lifts, TTD telephones, Braille signage and adapted toilets. Passengers requiring wheelchairs should request these from their airline before travelling. Disabled car parking spaces are available, and shuttles between the car parks and the terminal are wheelchair-accessible. There is also a pet relief area for guide dogs. As always, passengers who may require additional assistance are advised to contact their airline before travelling. Short- and long-term covered car parks, which are connected to the terminal buildings via walkways, are available at each terminal. The 'circle' surface car parks are located between terminals and are served by the free red bus shuttle route. The 15,000-space economy car park, split into areas corresponding to each terminal, is served by a separate shuttle route (blue bus) which links to the relevant terminal. For more information contact the parking office (tel: +1 816 243 5870). Car hire companies present at Kansas City International Airport include: ACE, Alamo, Avis, Budget, Dollar, Enterprise, Fox, Hertz, National, Payless and Thrifty. The car hire area is situated between the Marriott hotel and the economy car park.